The Sumerian solar system based on the information in Mr Sitchin's book the Lost Book of Enki. The Sumerian version of the creation of our Solar System. In the beginning there existed the Sun (Apsu), encircled by the planet Tiamat, and the planet Mercury (Mummu). Then, between Tiamat and Mercury, came into being the planets, Mars (Lahmu) and Venus (Lahamu). Then there came into being, beyond the planet Tiamat, the planets, Jupiter (Kishar) and Saturn (Anshar) along with their ’emissary’ Pluto (Gaga). Last to come into being were the planets, Uranus (Anu) and Neptune (Ea). These nine planets, or ’gods,’ moved in a counterclockwise direction around Apsu, the sun. 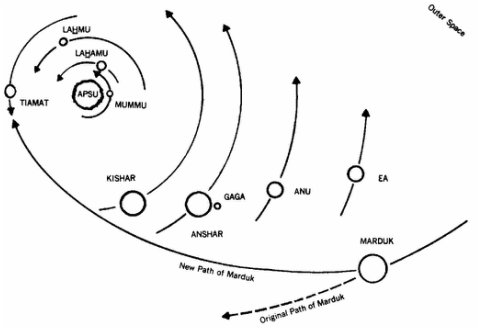 The path of Marduk took him toward the giants, Saturn and Jupiter. Marduk neared Saturn and Jupiter, and their massive gravitational pulls bent his orbit drastically inward, forcing his path to be aimed directly at Tiamat, The gravitational pulls of the two giants also caused three more chunks of Marduk to be pulled from his body; they too became satellites to encircle Marduk. ​and one of his moons named Evil Wind hit Tiamat splitting, but not quite breaking her in two, yet knocking her satellites away from her and smashing them to pieces. The paths they were thrown into were clockwise, like Marduk's, and their paths would become large, elliptical orbits around the Sun. They had been changed into the comets which regularly revisit this solar system. ​Her largest moon Kingu who nearly acquired his own orbit around the sun, was left bound now forever to the damaged Tiamat. The encounter between Marduk and Tiamat caused his orbit to be bent, even more, resulting in his becoming a planet or 'god' which was destined to encircle the Sun forever, and because he now was trapped in an orbit, Marduk's destiny was to return to the scene of the collision. He was, therefore to cross over the site of the collision. 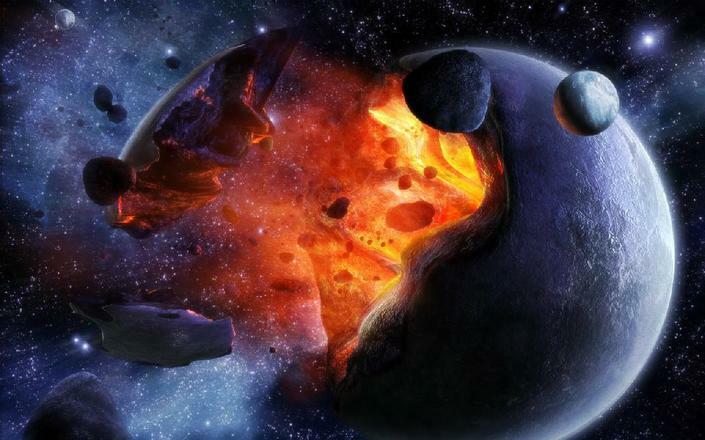 And for that reason, Marduk became known as Nibiru, the planet of crossing. ​Nibiru passes Tiamat, for a second time and this time Nibiru's gravity hits Tiamat and rips her into two halves, the lower part of Tiamat was smashed to pieces, to become the asteroid belt that to this day remains in orbit around the Sun between Mars and Jupiter, where the mighty Tiamat once existed. The asteroid belt was called the Hammered Bracelet. This second collision formed the basis of the creation story, and the hammered bracelet (which was previously mistranslated as 'firmament') was named the heaven. Life was also passed between worlds from Nibiru to Tiamat. 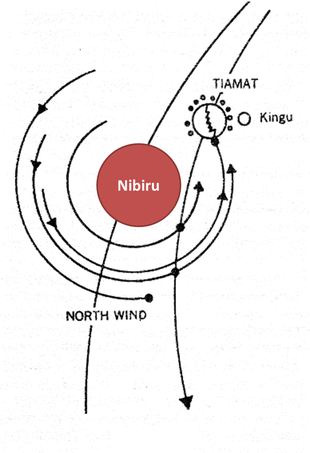 As Nibiru continued on, trampling in its path the lower half of Tiamat, another one of his satellites, called the North Wind, struck the remaining intact upper half of Tiamat. The force of this secondary impact thrust the remaining intact half of Tiamat away from her original orbit, to become repositioned between Venus and Mars. It was at this point that the remaining half of Tiamat took on the name of Earth (Ki), as noted in the Hebrew tradition. The thrust gave the remaining half of Tiamat, or Earth, her axial spin and therefore her ability to experience the changing days and nights. Only Kingu continued to orbit around Tiamat as a satellite; he would later be called Lunar the Moon. Nibiru settled into a orbit around the sun, a Shar the orbit was named. The destruction of Tiamat and the corresponding creation of Earth out of the wreckage resulted in the melting of the ice-covered surface and the remaining land masses of Tiamat being concentrated in one spot as a continent (i.e.Pangea). And the waters of the Earth surrounding the land formed the ocean filling the wound of the Earth, this wound we know as the Pacific Ocean. As a result of the collision of Nibiru and Tiamat, and the alteration of the order of the planets, the satellite of Saturn, Gaga was jolted out of its orbit to take on a new orbit around the Sun as a planet itself. The disruption that caused Gaga to acquire its own Tablet Of Destiny, set it on an orbital plane that differed from the other planets we now call it Pluto. The creation epic proceeding from the point of the collision of Marduk / Nibiru with Tiamat, as told by the ancient Sumerians, corresponds almost exactly with the Hebrew tradition as told in Genesis; they both corroborate the assumptions made by science. Beginning with the eruption and flowing of molten rock, which sent volcanic debris into the formless skies, all three disciplines detail the creation of an atmosphere as a result of the accumulation of clouds and mists, which blocked out a certain amount of the Sun’s heat. 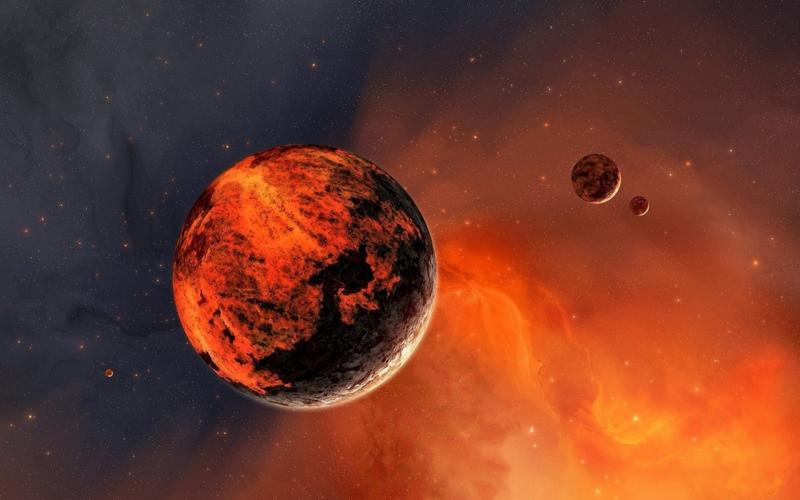 That resulted in a cooling of the molten rock to form the continent(s) and the creation of water to surround the continent(s) as the ocean(s). From the lands, waters and atmosphere arose mountains, rivers and the forces of weather.